Each month Leicester Digital invite a keynote speaker to fascinate us with what’s new and hot in business. This month we had an eye-opening presentation by Priscilla Morris from Loud and Clear Voice Coaching. Priscilla has many years experience in inspiring and motivating businesses on how to use your voice to become a leader, effective manager or trainer. Whether your presentation is in front of a formal audience or you simply want to be heard in a meeting, Priscilla has been able to help people become effective communicators in all scenarios. I was blown away by Priscilla’s’ outlook on the importance of how “your voice should be your calling card, your marketing tool and your sales agent”. Taking into consideration the subconscious impact your voice has on your audience is key. Whether presenting to a group or discussing internally in a business environment, you are being judged and in effect stereotyped simply by the way you sound in any particular setting. Priscilla emphasised that, selling is about communication and in many cases, we take our own voices for granted. Every time you speak you are somehow influencing others subconsciously. In business, it helps if that initial conversation is a positive one. First and foremost, control your breathing. This in effect will control your volume and energy. Ever found yourself in a room full of strangers trembling with nerves, take a deep breath and relax – breathing technique is key when it comes to controlling your nerves and pace. A slower pace of breathing will make you more relaxed, in turn making you look for comfortable in front of your audience and ensure you project your voice at the right level. Pronunciation is imperative. Lack of clarity in pronunciation opens you up for immediate negative assumptions. Depending on how clearly you pronounce your words and whether or not you finish your sentences, your audience is likely to be put off by subconsciously creating assumptions about you, your life, your age, and where you’re from. This is key in an interview or presentation setting, lack of clarity in finishing your sentences could leave you open to subconscious stereotyping. But fear not with practice, clarity will develop over time. Accent, volume, delivery and pronunciation all leave you open to assumptions being made about your character. All these factors define us the moment we meet new people in any surrounding. Always keep these points in mind, think about how you sound. Moving from one extreme to another or fluctuating in volume can confuse your audience and lead to a loss of interest. Inconsistency in your communication can damage your credibility and decrease your effectiveness as a persuasive speaker. Like singing, test the pitch range on your spoken voice, low to high. Pitch is affected by emotions – are you excited, are you being sympathetic? Focus on your pitch and the pace at which you deliver will keep your audience interested in what it is you have to say. A shift in pitch effects the people you talk to, they can offer empathy, sincerity, sympathy or aggression. Test your pitch range and use it to change the mood of your audience to match your situation or circumstance. The focus is on projecting your voice and engaging your audience. Priscilla also touched on how we inflect our sentences. An inflection is a change in the form of a word (typically the ending) to express a grammatical function. An upward inflection at the end of a sentence is delivered with a higher tone and indicates a question, it also indicates that you may not be finished. A downward inflection is delivered with a lower tone and indicates control and an end to your statement, ideal for controlling the conversation and applying a degree of dominance to the conversation. My most valuable take away from the presentation was the importance of thinking about how to deliver your content, focus and thought can have a big impact on your communication. Communication is fundamental to who we are and what we do. Your voice should be a part of your business tool kit, it is central to the way you communicate, use it well. 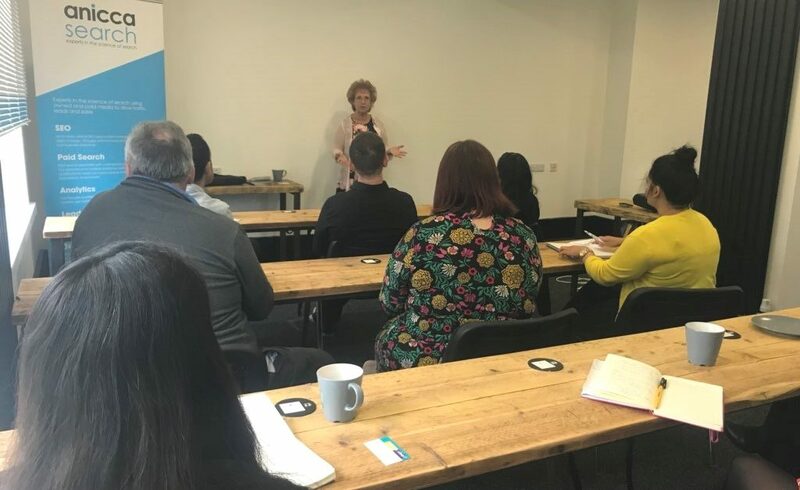 To learn more about whats new in digital and network with other marketeers come along to Anicca’s monthly networking event, Leicester Digital, held on the first Tuesday of every month at the Anicca offices, Leicester.